The Greek cuisine is part of the Mediterranean cuisine. Due to the geographical features of the country as a hub between the West and the East and its proximity to the Balkans and the Orient, various influences have found their way into Greek cuisine. The influence of Greeks from the coast of Asia Minor and the Black Sea as well as the geographic features of the country, which is very mountainous on the one hand, and on the other hand, an island and coastal region, haveinfluenced the development of regional kitchens in Greece. The characteristic "mountainous" terrain restricts the possibility of livestock breeding such as cattle, and rather allows the breeding of sheep and goats. At the same time, however, inhabitants have learned to use wild herbs and vegetables that grow in forests or mountains in their food. Greece’s proximity to the sea adds fish and seafood on the menu. What is typical of the Greek cuisine? The use of olive oil, not only for the preparation of salads, but also in cooking plays an important role. It does not necessarily outweigh the consumption and thus the preparation of fish and meat (mainly goat and sheep meat, but also beef and pork), but goes along with the preparation of many vegetables using spices and herbs such as mint, oregano, pepper, sage, thyme, cinnamon and wild herbs (e.g. chervil, dandelion). Not to mention the many different appetizers that are typical of the Greek cuisine and often accompany "warm" food or the appetizer course. All main courses are usually eaten with sheep or goat cheese, olives and white bread. 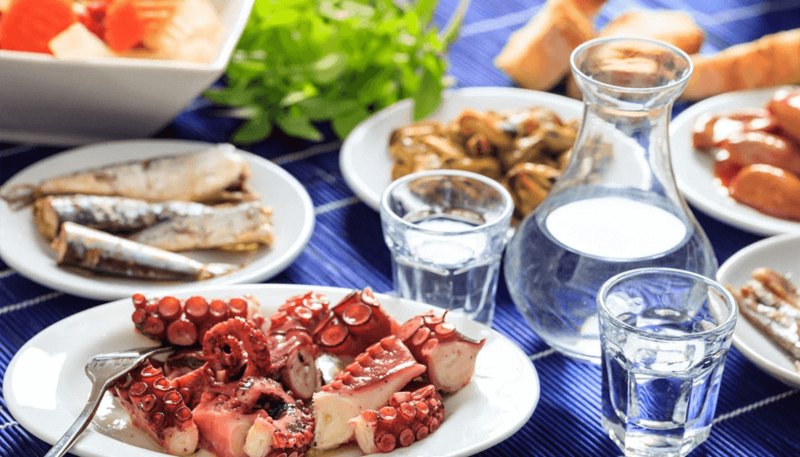 To quench the thirst and add taste, accompanying warm meals or during the appetizer courses, you will find water, wine, retsina, beer or ouzo / tsikoudia / tsipouro. The most popular non-alcoholic and hot drinks include Greek mocha, cold-served Frappé coffee, mountain tea, milk, orange juice and lemon soda. The most important characteristic of Greek cuisine is that eating is not just about the food itself. The Greeks like eating together with family and friends in a sociable round, being together, talking, discussing and being happy. Ancient sources (Homer, Hesiod) prove that many of the basic and main elements of modern Greek cooking originate from ancient cooking: be it fish or olives, olive oil or vegetables, figs, barley or wine, just to name a few. The preparation was rather simple and included few spices: the basic foods were bread and cereal porridge, vegetables, meat and fish and wine. Archestratus is considered the first "cookbook author" of antiquity, with his poem "Gastronomia", which means something like poetry for the stomach, in the mid-4th century BC. Although it does not contain detailed cooking recipes, it does contain descriptions of how meals should be prepared. Spices from other regions were already known in antiquity: cumin from West Asia, capers from the Sumerians or cinnamon from China. The meals themselves were as follows: in the morning there was fruit, bread and olive oil. The main meal of the day came in the evening, consisting of smaller portions and fruit, honey and nuts, cakes and sweets and wine. During the Byzantine era, new elements such as e.g. new spices or vegetables / fruits or other types of preparations came from the Middle East, India and the Balkans. The Byzantine Empire spanned the Balkans and the northeastern part of the Mediterranean via Turkey to the Arabian Peninsula, where many ethnic groups lived together, who had their own regional cuisine, but not without mutual influence. The new vegetables include, for example, eggplant from India or spinach from Persia, new types of fruit, lemons and oranges. The use of fish roe goes back to the Byzantine era (taramosalata), as well as sugar, which was and is still used instead of honey for syrupy food, and filled vine leaves (Dolmades / Dolmadakia ). Austrian cuisine (strudel). Ottoman / Oriental dishes, spices and preparations were added after almost over 400 years of Ottoman Empire rule: cooking with yoghurt (Crete) and the use of yogurt in general for starters and desserts or sauces, the preparation of food in the oven, layered main courses (like mousaka) or desserts (baklava), the use of cumin and cinnamon (northeastern Greece). Even coffee, which was spread over Persia in the Ottoman Empire, became part of Greek cuisine. In the twentieth century, Greek cuisine developed in two ways: on the one hand through its contact with "international" cuisine, whereby elements such as béchamel sauce found its way into Greek cuisine, and on the other by the increase of meat consumption. Greek appetizers (Orektika or Meze) are very common. These include olives or cheese, dips such as tzatziki, taramas or kopanisti, dolmadakia, pies (sweet or savory fillings, vegetarian or with meat, round or angular shape), small dishes with cheese, seafood, fish or meat. The seasonal traits of Greek cuisine are reflected in the fact that, depending on the season, the dishes also vary. What is being harvested right now usually determines the look of Greek cuisine. In summer, it’s farmer's salads with ripe tomatoes and cucumbers, feta, hot peppers, olive oil and oregano, eggplants and zucchini, peas and artichokes. In winter, there are more soups and stews on the program, as well as pumpkin and cabbage, legumes, cereals, chestnuts and quinces. The Greek cuisine is particularly affected by church Lent and holidays. Fasting takes place before Easter, before the Assumption and before Christmas. Many Greeks follow the fasting rules to be observed. These rules include non-consumption of meat or animal products and alcohol. Orthodoxy’s major celebration is Easter. After the seven-week Lent, Easter is celebrated among family, with red eggs and Easter soup. On Easter Sunday, festivities usually take place outdoors, with roasted lamb / goat. At Christmas, pork dishes are preferred, while on New Year's Eve mostly stuffed turkey is served. Classic sweets of the Christmas season are the honey nut macaroons (Melomakarona).